MARCH BLOWOUT PRICING!!! 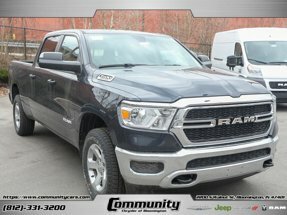 2018 Ram 1500 ST Express Crew Cab 4x4 in bright white. 5.7L Hemi V8 with 8-speed automatic transmission. Express Package equipped with cloth 40/20/40 bench seat, Popular Equipment Group, Front and Rear Rubber Floor Mats, LED Bed Lighting, UConnect 3 with 5" display, Class IV Receiver Hitch, Trailer Brake Control, and more!